Luo Li Rong born in 1980 in Hunan (China), is an artist-sculptress who graduated in 2005 with high honours from the prestigious Central Academy of Fine Arts (CAFA) in Beijing. Her graduating project received numerous awards. At the age of 18 (1998) Luo Li Rong attends the Changsha Academy of Arts (Hunan-China). At the age of 20, she joined for 5 years the CAFA (Beijing) in the department of Sui Jiang Guo, studying ceramics with Lu Pin Chang and sculpture with Sun Jia Bo. During this period, she participated in multiple public sculpting projects, most notably for the 2008 Olympic Games in Beijing, installed in Da Lian Park from 2003. Now living in Europe, she has seen since 2014 a rising recognition and appreciation of her art from international galleries and collectors. Luo Li Rong’s sculptures in their entirety are part of contemporary Chinese culture while offering a subtle and relevant understanding of the West. Luo Li Rong is one of those rare artists who have benefited from rigorous teaching from demanding masters. 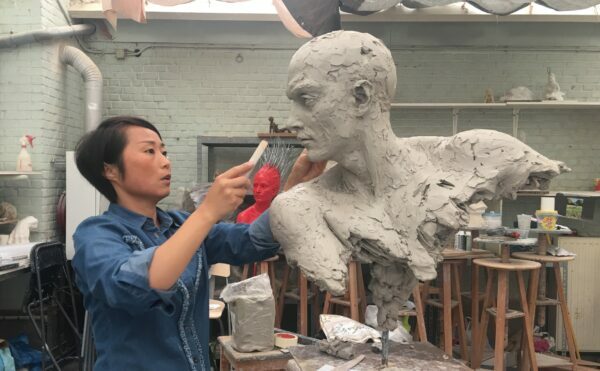 Masters who today continue to follow attentively the path of their student.The artist Xiao Xiao Qiu from the Changsha Academy of Arts quickly sees in her a real talent to perceive forms in space and translate them into clay. He is the one who encourages and helps her to prepare the CAFA entrance exams. The artist Sun Jia Bo of the CAFA has a great influence on her sculptural approach and leads her student to increase her attention to the presence of the model and what emerges from it. With these precious encounters and constant personal research, Luo Li Rong gradually finds her way and lays out the outlines of her future sculptures. Her current style is characterized by a rare know-how and a surprising power of realization.